We investigated the provision of RTMS by allowing remote experts in Aberdeen to view real-time PLUS images displayed on a smartphone (iPhone-4, Apple, Cupertino, CA). A portable ultrasound (Sonosite 180, Sonosite, Bothell, WA) in Calgary was interfaced to a laptop computer (Aspire 5741, Acer, Kuala Lumpur, Malaysia) via an analogue-to-digital converter (VC-211V, ActionStar LinXcel, Taiwan) [Figure on-line supplement]. Xsplit Broadcaster (SplitMediaLabs ltd, Hong Kong) allowed video-streaming of both an inexpensive head-mounted webcam (LifeCam VX-2000, Microsoft, Washington) and ultrasound over Skype (Skype, Luxembourg), easily viewed on any smartphone. 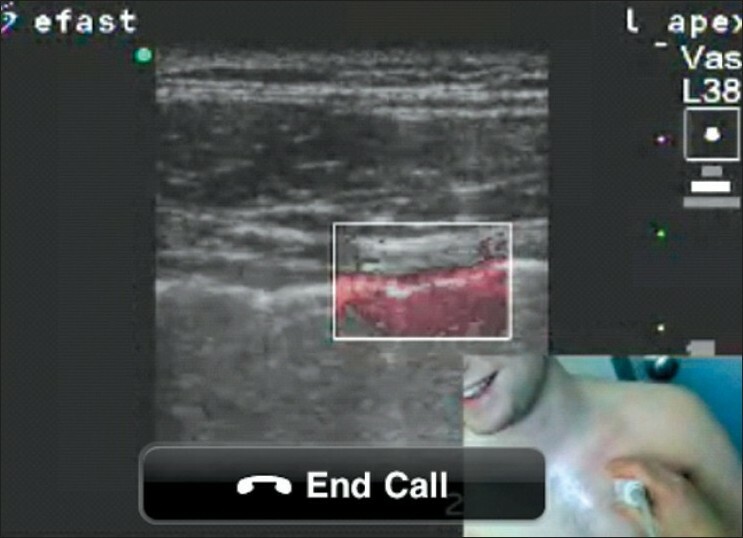 The remote experts were thereafter able to easily view both the Calgary examiners hands and probe and resultant ultrasound images and to audibly bidirectionally communicate during the conducting of PLUS, with the iphone images deemed of diagnostic quality demonstrating clear evidence of real-time lung sliding [Figure 1]. While best appreciated real-time, the color-power Doppler function also documented this movement as the "Power-slide,"  confirming and documenting respiration and pneumothorax absence. While ultrasound images have been previously viewed over smartphones, we believe this is the first utilization of this ever more-prevalent technology to allow cost-minimal telementoring in lung telesonography. Therefore, despite the myriad of challenges for global health improvements, we believe that as the globe is shrunk by informatics, remote experts in developed nations could increasingly assist with education and clinical care delivery using affordable technologies that are likely to be already in our coat pockets. 1. Lichtenstein DA, Meziere GA. Relevance of lung ultrasound in the diagnosis of acute respiratory failure: The BLUE protocol. Chest 2008;134:117-25. 2. Kirkpatrick AW, Sirois M, Laupland KB, Liu D, Rowan K, Ball CG, et al. Hand-held thoracic sonography for detecting post-traumatic pneumothoraces: The Extended Focused Assessment with Sonography for Trauma (EFAST). J Trauma 2004;57:288-95. 3. Sargsyan AE, Hamilton DR, Jones JA, Melton S, Whitson PA, Kirkpatrick AW, et al. FAST at MACH 20: Clinical ultrasound aboard the International Space Station. J Trauma 2005;58:35-9. 4. World Health Organization WH. Telemedicine: Opportunities and developments in Member States: Report on the second global survey on eHealth 2009. Global observatory for ehealth, series 2. Geneva, Switzerland: World Health Organization Press, 2010. 5. Crawford I, McBeth P, Mitchelson M, Lall R, Tiruta C, Kirkpatrick AW. Big Brother could actually help quite easily: Tele-mentored "just-in-time" telesonography of the FAST over a smartphone. Ann Emerg Med [In press]. 6. Cunningham J, Kirkpatrick AW, Nicolaou S, Liu D, Hamilton DR, Lawless B, et al. Enhanced recognition of "lung sliding" with power color Doppler imaging in the diagnosis of pneumothorax. J Trauma 2002;52:769-71. Wah, K.C. and Man, C.W. and Ha, W.J.Y. and Lai, V. and John, W.K.S. McBeth, P.B. and Crawford, I. and Blaivas, M. and Hamilton, T. and Musselwhite, K. and Panebianco, N. and Melniker, L. and Ball, C.G. and Gargani, L. and Gherdovich, C. and Kirkpatrick, A.W.